I've got a piece in today's WaPo on the diminished correlation between the tightening labor market and wage and price growth. This is evidence of the well-known flattening of the "Phillips Curve," the statistical relationship between nominal wages, prices, and tightness in the job market. 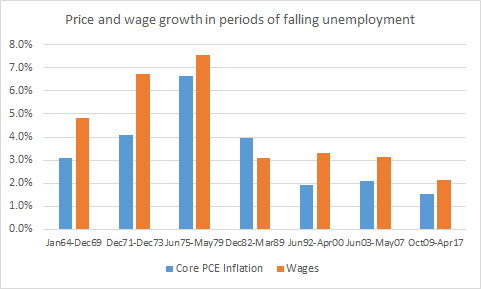 The figure below shows annualized growth rates of a) core PCE inflation and b) nominal wages of blue-collar factory workers and non-managers in services over numerous periods of falling unemployment. Since the 1980s, those growth rates have been falling. In the current episode of falling unemployment, price growth has been particularly slow. Those familiar with this phenomenon will recognize this observation as the flipside of the question we were asking when unemployment was 10 percent: "why isn't the rate of inflation falling." My WaPo piece gets into the why's and why-this-matters. Here, I just wanted to post some complementary evidence. 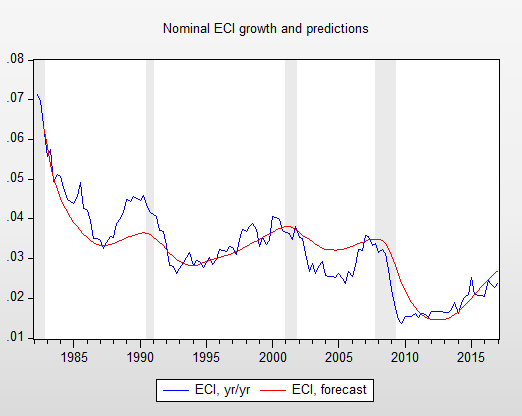 A simple model does a decent job of predicting yearly changes in the ECI wage index. The model includes two lags of the dependent variable and a measure of full employment: u-u*, or unemployment minus the CBOs estimate of the full employment rate. The figure shows that the model tracks wage growth through the tight-labor market of the 1990s, but over-predicts in the 2000s. Toward the end of the series, there's a hint that ECI wage growth may start to underperform the forecast. 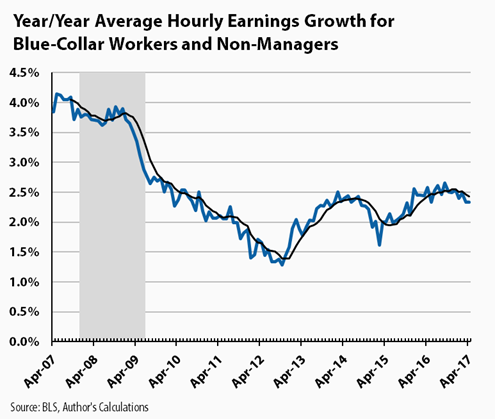 The growth in the blue-collar, non-managerial hourly wage has also flattened in recent months, even as the job market has tightened further (the smooth line is a 6-mos moving average). 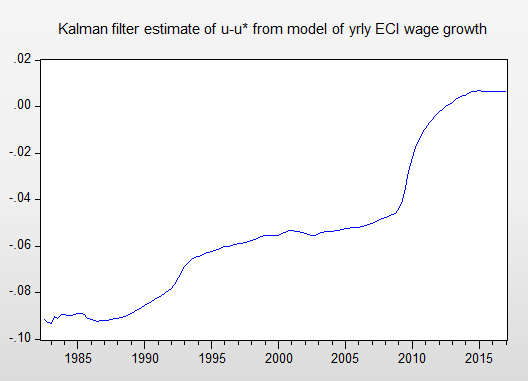 Finally, Kalman filtering is a useful statistical technique to test whether and how much an economic relationship–in this case, the correlation between ECI wage growth and u-u*, or labor market tightness–is changing over time. The last figure shows that in a model with yearly ECI changes as the dependent variable, the coefficient on u-u* has drifted up and is about zero now. Moreover, the upward drift accelerated a lot in the last few years. I say what I think this means–and cite many explanations from others whom I bugged about it–in Monday's paper. But the facts of the case look pretty solid to me, at least for now.